It is one of the few Vitamin C products on the market that is retained by your body & not rapidly excreted. The fruit of the Acerola Cherry is one of the richest-known sources of vitamin C.
Acerola also contains an array of bioflavonoids, vitamins, minerals & other phyto-nutrients, making it an ideal food-based source of nutrition. The free radical scavenging benefits are also useful for lessening the tendency to degenerative disease & cellular aging. When we first take a tonic such as Acerola, a wonderful energy enters the system, conversely taking large doses of vitamin C can lead to imbalances; Nature really does know best! Rosehips have been traditionally used as a source of vitamin C. Compared with foods such as oranges there is a much higher concentration of vitamin C - approximately 1,700mg of Vitamin C in 100g of dried rosehip. 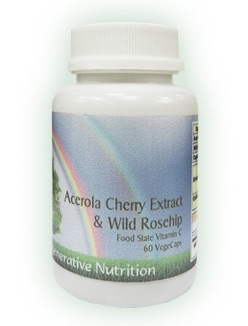 Although this is considerably less than the ultimate food state vitamin supplement - Acerola, there are an extensive range of useful nutrients in the rosehip. Intensive Use: 3 capsules twice daily. A Natural, Food State Source of Vitamin C, Acerola Cherries are one of the richest natural sources of vitamin C - higher than rose hips. The body cannot manufacture Vitamin C - it must be obtained from the diet or supplements. Vitamin C in foods works in combination with many phytonutrients such as different types of bioflavonoids, flavenols and a broad range of anti-oxidants; taking an isolated extract of pure vitamin C will not reap the same benefits. To state we need a certain amount of vitamin C daily for optimum health can be confusing and misleading. Taking a refined source of pure vitamin C without its natural co-factors has a tendency to leach minerals from the system. The cellulose and bulky roughage is eliminated, but the bulk of the nutrients are retained; the soluble extract from Acerola increases the vitamin C content to a high of 25%. It contains many vitamins and minerals that work in conjunction with vitamin C. Only by taking vitamins and minerals in a natural form and group, can the body maintain its balance. Acerola Cherries are an excellent source of powerful antioxidants, they are rich in protein and mineral salts especially, iron, phosphorus calcium and also have marked anti-fungal activity. The free radical scavenging benefits of Acerola are also useful for preventing abnormal growths and fighting cellular aging. Vitamin C (as with all other nutrients) cannot complete its action as an isolate. Small amounts of a complete package of anti-oxidant nutrients along side the vitamin C provide an effective anti-oxidant protection and support the integrity of healthy collagen throughout our circulation, skin and all other tissues. A medium size orange contains about 70 mgs. The amount of vitamin C required to offer protection against chronic disease and maintain tissue saturation is in the region of 200-500 mgs daily, whereas the amount to prevent fatal acute disease (scurvy) is in the region of 30-60 mgs daily. It seems absurd that the so-called RDA is set at the scurvy prevention level. A pound of grapes only has a few milligrams of actual vitamin C, but combined with the ripe skin and seeds offers for example, excellent anti-scurvy protection. When we first take a valuable natural tonic such as Acerola, with a little attention and observation we can feel a wonderful energy entering the system. Conversely, taking large doses of vitamin C can quickly lead to imbalances such as anxiety, poor sleep and mineral depletion. Nature really does know best. By using Acerola, or the extract, we have a potent, natural remedy from nature’s store. There is a story of a lone yacht’s-man who took one gram of refined vitamin C daily. After several months he developed scurvy. An orange a day, (or even more effective on a weight for weight basis would be Acerola cherries) would have prevented the scurvy, even though an orange only contains a few milligrams of vitamin C.